A 75 yeaIr old gentleman was previously deemed uninsurable by 7 life companies for $9,000,000 of Survivorship coverage due to extensive coronary artery disease history. An initial clinical triage unveiled past inferior and anteroseptal heart attacks, diffuse coronary artery disease, enlarged heart, Stage II chronic kidney disease and a 2012 brain injury. However, further review indicates remarkably favorable cardiac function, essentially normal kidney function tests and normal neurological profile. Moreover, it is critical that the physician be willing to participate in the underwriting presentation on behalf of his patient. Upon gaining approval from the client, we engaged his cardiologist in a lively and very enlightening discussion buffeting the risk differentiation strategy at hand. Well-established and totally collateralized coronary vessels circumventing the underlying CAD occluded arteries. Outstanding performance on both treadmill and nuclear testing noting the small segment scarring of the past heart attacks yet in the presence of superb overall cardiac function and the absence of any arrhythmias or hypertension. Re-classification of Stage II chronic kidney disease as mild renal insufficiency with normal kidney function tests. Reaffirmation of a fully evacuated subdural hematoma (acute photo safari trauma) without any neurologic component or residual. A World Class triathlete by age category, exemplary exercise regimen with remarkable cardiovascular health and performance. The aforementioned detail was captured in a written summation from the cardiologist and included in a much more amplified presentation to a select insurance carrier. 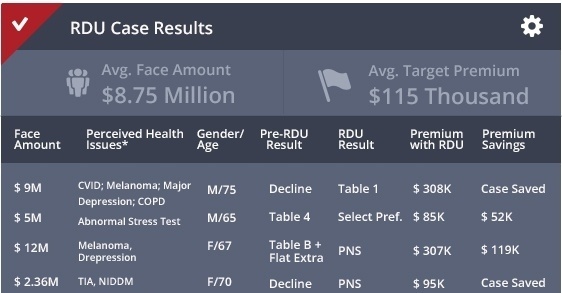 The unique idiosyncrasies now in play produced a differentiated view of the client and approval at Table C pricing for $9,000,000 of SUL coverage. RDU has created a much deeper and highly valued relationship between the client and advisor based solely upon underwriting advocacy. The insurance carrier welcomes an engagement of significance with all applicable mortality risk issues clearly articulated. The advisor gains satisfaction in “always doing the good and right thing for the client” in conjunction with placing $210,000 of target premium. The goal of Risk Differentiation Underwriting is not to change the way Home Office Underwriters and Medical Directors assess risk. Rather the aim is to recognize when a particular case exhibits qualities which are inherently different from a more standardized version of the same risk. At Brokers’ Service we employ a unique underwriting strategy on those engagements that demand more time and piercing intellectual inquiry. 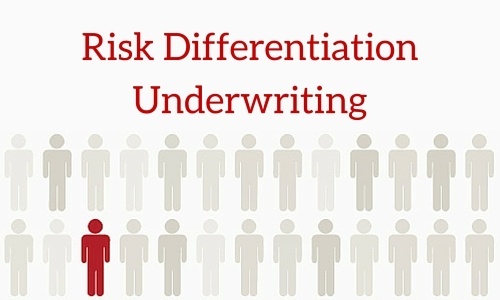 It’s called Risk Differentiation Underwriting—RDU. Do you have a case in mind for RDU?